We are a forward looking, multi-cultural and inclusive faith community, proclaiming and doing Christ's work of love and justice in the greater New London area and the world. The schedule of Holy Week services and activities at St. James can be found by clicking here. Deacon Ellen has researched a series of resources to accompany activities related to our Season of Racial Reconciliation, Justice and Healing, which can be found on our website's Ministries page or clicking here and scrolling down to this ministry. Easter flower delivery to shut-ins— Please consider helping to brighten Easter for members of our parish family who are homebound or in healthcare facilities by taking one of the plants from our Easter decorations to him/her. Select someone who is near to your home or office, and it won’t take much time at all! A sign-up sheet can be found in the parish hall. Please put your name next to the name of the person to whom you’d like to take a plant. If directions are needed, please contact Ellen in the parish office, 860.443.4989. Plants may be delivered immediately following the Easter service or anytime during the week of Easter. Please keep in mind that the parish office is closed on Easter Monday. 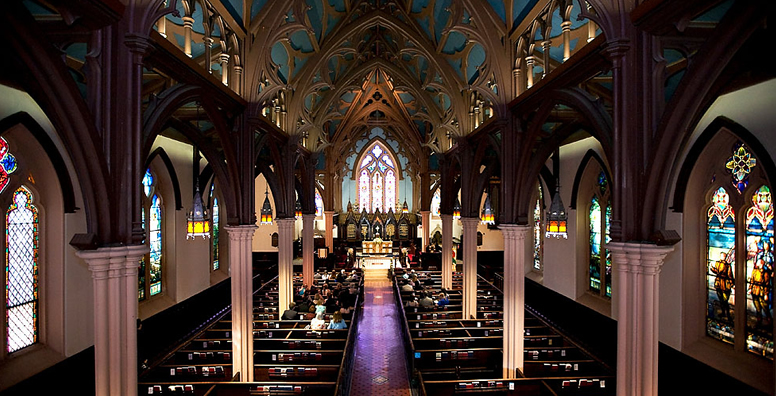 The final Choral Evensong service of this season will be held at 5 PM on Sunday, April 28 at St. James. The Anglican Singers will perform works by Byrd, Rose, Stanford and Wesley. For a more complete listing of the service, click here. Music on Whale Oil Row on Sunday, May 19 at 3 PM will feature an organ recital by the Rev. Benjamin Straley, Music Director of The Anglican Singers and Assistant Rector at St. John's Episcopal Church in Essex. Benjamin is the former organist and associate music director for the National Cathedral in Washington, D.C. The recital will include works by Bach, Guilmant, Handel and Elgar. A donation of $10 for the recital is suggested. Rejoice in and give thanks for the miracle of all life that is made possible by the grace of God through water. Come on a River of Life Pilgrimage hosted by the South Central & Southeast Regions of the Episcopal Church in Connecticut, in coordination with Kairos Earth. Pilgrims are invited to move deeply into prayer, contemplation, and movement by canoe or kayak as a community together from May 24-31. For more information or to apply for this opportunity please visit: https://kairosearth.org/pilgrimage/ or contact Rachel Thomas (rthomas@episcopalct.org) or Jo Brooks (jbrooks@kairosearth.org). Sermons are recorded and can be found by clicking the "Sermons and Media" red button on the left side of this webpage or by clicking here. For more information about activities and events later this month, click for The Net here. For updates, reports or pictures of events as they happen, go to our Facebook page by clicking here or to our Instagram account by clicking here. The monthly Google calendar of events can be seen by clicking here.